While tearing out floors would normally seem like a headache, removing laminate flooring isn't as a big of a challenge as you might expect. With the right tools and this handy guide teaching how to remove laminate floors, you'll be able to pry up those planks in no time. Laminate flooring has been a popular floor choice since its invention in the late ’70s. With a typical lifespan of 15 to 25 years, the material is durable, but it will inevitably get faded, scratched, gouged, or go out of style. Whether you want it gone because of its condition or because it’s no longer in fashion, the process for how to remove laminate flooring is simple enough to do yourself. That said, you’ll want to recruit some friends to help you haul out the bulky and heavy flooring. You might also want to consider renting a dumpster. Compare prices from several local dumpster operators since your garbage hauler may not be the cheapest—and know that prices vary widely between haulers. Before you can start tearing up your laminate floors you need to know which kind of laminate you’re working with, so you remove it properly. • Glued laminate was the first generation of laminate floor. As you might have guessed, the planks are held together with glue. This kind isn’t as popular anymore, but if your floor is old, this might be what you’re dealing with. Glued flooring can’t be reused, so you can remove the planks with reckless abandon. 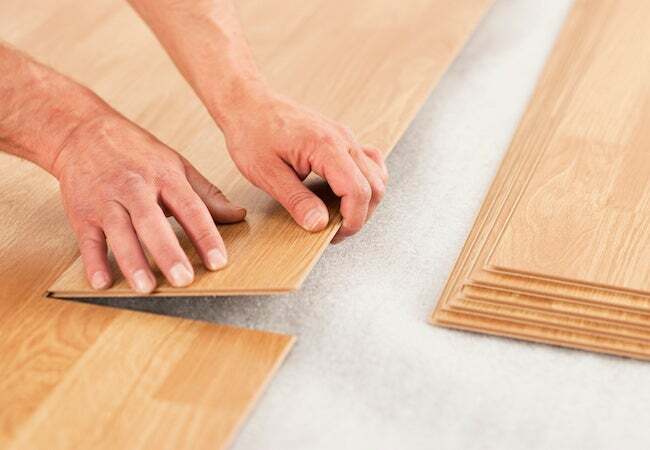 • Floating laminate or snap-together laminate is when the laminate floor isn’t attached to the subfloor, instead the flooring “floats” on top of a foam cushion. This the next generation of laminate. Its planks were designed to fit together without glue. The tongue and groove edges are coated with a sealing product and the planks snapped together. This type of laminate can be reused. Go slowly and handle with care to avoid chipping if you want to use it again. Put on heavy leather gloves and boots before removing and handling the planks. Laminate floor edges are sharp and can slice through your skin. Also, laminate planks chips easily and the flying chips can cause serious eye injuries, so wear eye protection the entire time you’re removing and hauling laminate planks. Move all the furniture out of the room so that you can access all of the laminate planks. Then, get ready to remove the baseboards, which cover the edges of the flooring around the room’s perimeter. Use your utility knife to cut along the top edge of all the baseboard molding. Your goal is to slice through any paint that’s bonding the base to the wall so you don’t tear the drywall as you pry off this woodwork. Slide a wide, 6-inch drywall knife between the wall and the baseboard. Then, insert your flat bar between the knife and board. The drywall knife will protect the wall from damage while prying. When the board is removed, use side cutters to clip the nails stuck in it or the wall. You can use your hammer to drive any remaining protruding nail shanks flush into the wall. Before you move on to the next piece of molding, use the felt marker to number the wall and piece(s) so you know where it goes back once the new floor is in place. Repeat until you’ve removed all the baseboard from the entire room. Pull up any transition strips, or the strips often found in the doorway(s) to a room covering seams in the flooring between rooms or smooth transition between two flooring types (say, from laminate to carpeting). Slide the “J” end of your flat bar underneath transition strips and pry up. Then, remove the screws holding the retaining channels to the floor. Be gentle during this part if you want to save the transition strips, as they can easily break. 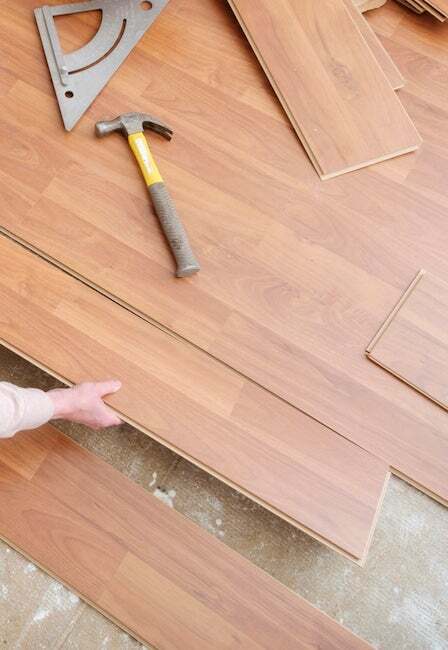 To remove the laminate floor itself, slide the “J” end of the flat bar into the gap between the wall and the first row of planks to pry up the first one about 45 degrees. Floating laminate planks will separate from those adjacent as you bend it up. If it’s glued, grab the plank with your hands and snap it back until the glued seam breaks. Repeat this procedure with each plank in the first row. With the first row removed, simply slide the chisel under each additional plank to lift it up. Then remove plank after plank and row after row until you’re done. Remove the foam padding from the subfloor. If your laminate was glued, use the floor scraper and heat gun to remove any residue stuck to the floor. Vacuum the entire floor with a shop vacuum to remove any wood or laminate chips. Store the base trim pieces in a safe place so they don’t get damaged in the time it takes to fill the blank slate with a new floor.